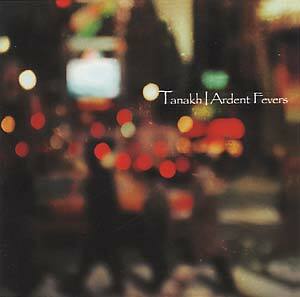 "Tanakh's Ardent Fevers marks the band's fourth release for Alien8 Recordings and finds Jesse Poe and company continuing to delve deeper into the world of psychedelic pop music. While this most recent work bares some resemblance to the band's debut Villa Claustrophobia, and their sophomore Dieu Deuil, it treads more in the sounds of '70s rock, resulting in an album less precious, and closer to Tanakh's live sound. Listening to Ardent Fevers one is treated to a beautiful array of lush compositions that capture the listener with memorable choruses and well thought out orchestration. Stellar tracks include the opening 'Drink to Sher,' which recalls Beck from his Sea Change period or Tim Buckley. 'Greybreathes' is an unforgettable piece of music that has you humming the chorus for hours. Just like most of the music of Tanakh, the focal point of this cut is the wonderful vocal style of Jesse Poe. 'Still Trying to Find You Home' starts off as Leonard Cohenesque folk dirge but builds momentum until it takes on the feel of Neil Young's Crazy Horse and comes close to 'freakout' thanks to some pretty serious soloing on guitar. The band then switches to the far lighter 'Restless Hands,' which recalls sixties era British folk-pop."